I feel as though I had a little bit of early Christmas cheer last week when I went to my letter box and found the next edition of Australian Patchwork & Quilting magazine waiting for me. 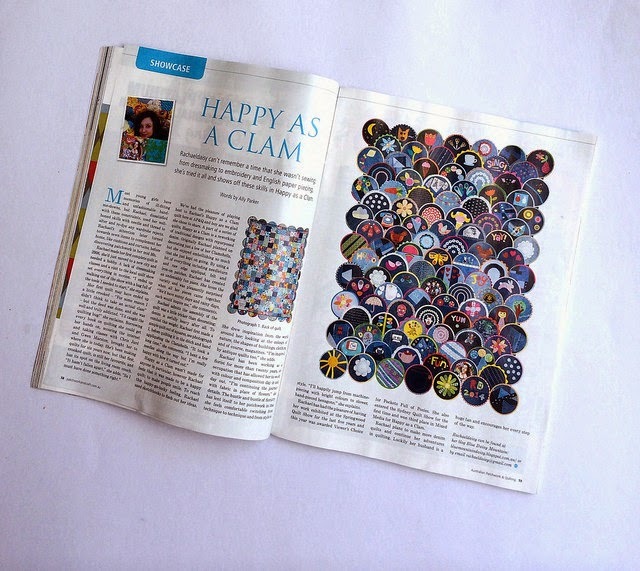 I flipped through the glossy pages and there on page 58 is an article about my Happy As A Clam quilt!! Just in case you're wondering, Yes, I did jump up and down with excitement and dance around singing "WooHoo!!". I'm so pleased this quilt is having it's moment in the spotlight. Happy as A Clam hangs in my hallway and as I pass it there's a little girl with a big sunshiny smile that catches my eye and I can't help but smile in return. A wonderful reminder that this is the season for sharing smiles. So with a happy smile I wish you all a very Merry Christmas, a super Solstice and lots of joyful times over the festive season. PS. Here's a little sneaky little giveaway for those who have read this far ... 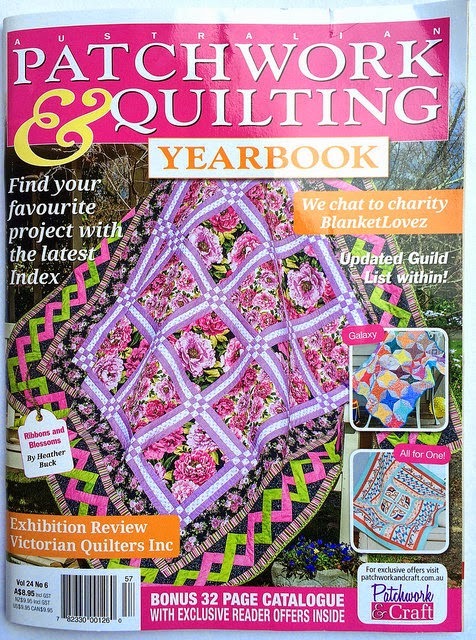 I know Australian Patchwork & Quilting magazine is hard to get outside of Australia so I would like to send a copy to a lucky overseas person. This giveaway is for Blue Mountain Daisy followers only, old and new. If you would like you name to be included in the draw just quote "Smile" in your comment. Congratulations and a reat reason to jump up and down and do a happy dance!! I always knew you were destined for great things .Happy Dance for you. I do like that magazine but it is hard to find here. I would smile if you pulled my name/number and I won the magazine. The embroidery done on the clamshells is lovely. Thanks for the offer. Oh Rachael, I am thrilled with and for you with such a great article! I'll smile :))))) until I get to see your quilt at the Sewing and Quilting Expo here in Cleveland this Spring. Sweet!! I know whoever wins this will be thrilled. I know I will be. Thank you for sharing your quilt and your excitement!! I follow you on Feedly. You are in my Favorites Folder. I loved your quilt when I saw it in the Bloggers Quilt Festival and am "Smiling" that it is in APQ. Yes, it difficult to find here in the US so thanks for a chance to win. Smiled as wide as that little sunshine girl when I got to the words Happy as a Clam! Happy for you!!! Would love to read that article, too. Thank you for the chance, interesting blog entry. The quilt makes me "smile" too. Thanks for all you share with us and Merry Christmas! You should be jumping up and down--how exciting to see your charming quilt in the magazine! I'd smile too! That is so awesome Rachael, you deserve notoriety for your creativity ! I have a big "Smile" on my face for YOU ! "Smile!" I hear that a lot from some people in my life. Such a beautiful quilt "smile"! Wishing you a Mele Kalikimaka! Smile! and congratulations. It is such a great quilt! Congratulations! 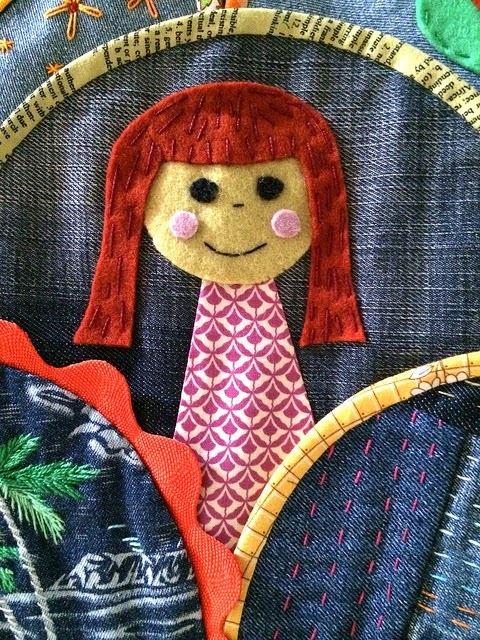 I am sure the "smile" on your face was even bigger than those on your adorable quilt! What a clever idea! Your ornament made me smile when I opened my email. Merry Christmas! h! ) :) ... And it brings a smile to my face also!!! HOW WONDERFUL, a great Christmas surprise and enough to make you SMILE way into the New Year :) Someone gave me a really cute small gift of Quilters Jam...Stop drooling, not to eat :) Will try to figure out how to send it! Smile! I love your quilt designs! What a lovely quilt. The motifs are so appealing/ Really brought a smile to my face. Thanks for the quotes on smile as are very true, especially for the need to smile to create joy. Happy holidays. Every time I see a picture of this quilt it makes me "smile"! I bet you're smiling as you read all these comments! Thanks for the opportunity to win! 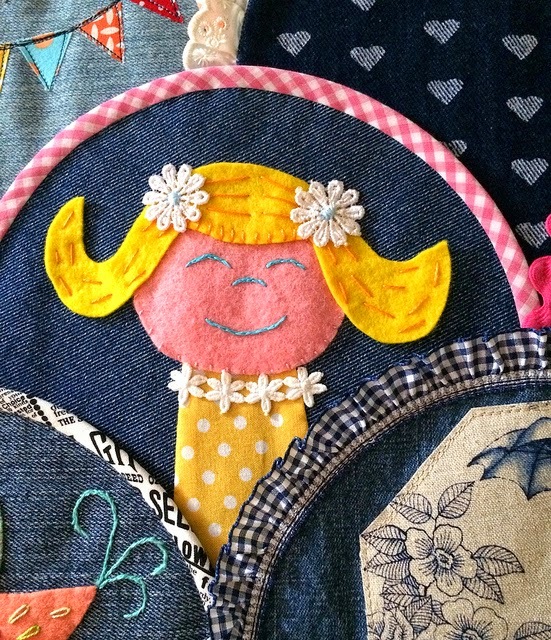 The magazine article about your quilt put a "smile" not only on your face but also on mine! Wishing you a very Merry Christmas and congratulations on the publication of your quilt! At the top of the blog I thought, "I'd love to read that magazine." Maybe I'll get to! Congratulations! Happy as a Clam (and your talent) needs to be shared and I am happy to see it published. I did indeed "smile" when I saw your achievement. Your blog always makes me "smile". Congrats and happy holidays! I have seen a smile bring so much to people I face in stores these days, doesn't matter if you know them or not. Especially older people and it cost you nothing. It makes you feel good too! !Thanks for the chance to win. Your posts always make me smile! Congratulations on the article and a very deserving one! I love that quilt too! 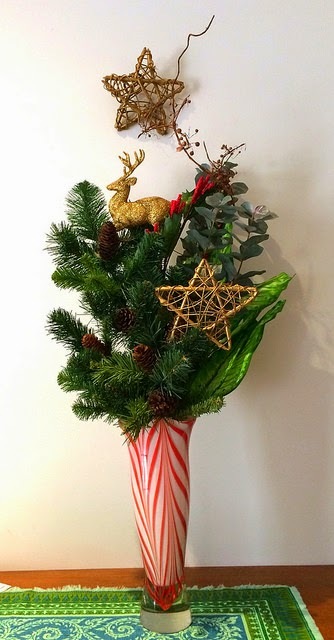 I love the festivity of your Christmas vase. It's really made me smile. Thank you, and happy Christmas to you and yours. Smile - it makes everyone wonder what you've been up to. BIG "SMILES" for sure!! Congrats!! And thanks for the chance to win! Merry Christmas!!! I smile at strangers all the time. They may think I'm a bit nutty, but I think think I'm giving them a gift! Wish everyone remembered to "Smile"! Love your blog! Happy Holidays! There's nothing like seeing your name, and a project, in print. Hurray for you! Hurray for the Happy As A Clam quilt! Have a very Merry Christmas! May your new year be filled with happiness and lots of "smiles". Your blogposts always bring joy Rachael! Those words are very special. Merry Christmas to you and all you love! Sending you a Christmas smile! I got my cultural fusion book the other day and found sujata's blog to tell her how much I love the book. I'm so glad I saw it on your blog. This book might have changed my life, not to sound overly dramatic, but the Freddy Moran/Gwen Marston books I have don't teach a lot of actual skills, and I needed someone to show me how to achieve the look. Thanks! Hi Rachael....congratulations, wow you. You must be tickled pink to have your Clamshells in the mag! What a lovely thoughtful giveaway for a lucky reader! Wishing you a very Happy Christmas and all the very best to you for 2015! Your "Happy as a clam" quilt is so well done, I truly love all the detail you have place on it. Love your little ornament Rachael, congratulations on being published in the magazine! How exciting. A smile is the shortest point between two people, have a smiley Christmas and an out loud laughy...( larfy, laughfly, gaffawly ) New Year. Congratulations Rachael! Very exciting! Christmas wishes to you and yours. I love your quilt! The little girl definitely makes me Smile! I would love to win a copy and see if I could make one! Congratulations, you have earned it and I'll do a big "woo hoo" for you to! Merry Christmas! This is the most wonderful quilt, so glad it is getting lots of recognition. Have a wonderful Christmas. Love the quotes. A smile costs nothing but can make someone else's day. Merry Christmas/Season's Greetings to you and yours too, Rachael! Congratulations on the magazine article!! What a happy looking quilt. Congratulations! And I read your DUQ profile the other day too - was so nice! Have a very merry Christmas, and thank you for this post today. My quilts make me happy too, and at Christmas this year I seem to need a little cheering up so I'm spending a lot of time "viewing". Smile! That's what I did while reading your posting! What a lot of smiles you've brought to all of us enjoying your quilts both on your blog and in the publications you've been highlighted in! Congratulations! Have a very Merry Christmas! Congrats, Rachael! That's fantastic to be featured! It's a great quilt! Your Happy as a Clam quilt is wonderful--and sure to make everyone who sees it "smile". Merry Christmas to you! You deserve to jump up and down, the quilt is awesome! So happy for you! Smile!!! Too funny. I always smile when I read your posts :) Good luck to the overseas recipient that wins and I hope you have a fun festive season too! YEAH!!!!! congratulations! that is so cool! you have a smiley good holiday too! Love to hear about the jumping up and down - what a great rush!! And what a well deserved one. Wishing you a wonderful, healthy and creative year ahead! Congratulations, Rachael. How great to see this lovely article in the mag. Definitely worth lots of jumping up and down. Well done!! This is definitely some perfect Christmas cheer! Best wishes to you for a wonderful Christmas!! "Smile!" Congrats on the magazine spread - well deserved too! Merry Christmas to you and Mr. Daisy! I wish both yourself and your husband the very happiest of Christmases, and a safe new year. See you next year Rachael!! Merry Christmas to you and your beloved. Congrats on the magazine, such well deserved sucess. An amazing year for you. Your little girls made me smile. Congrats again on your amazing quilt and the Magazine article! 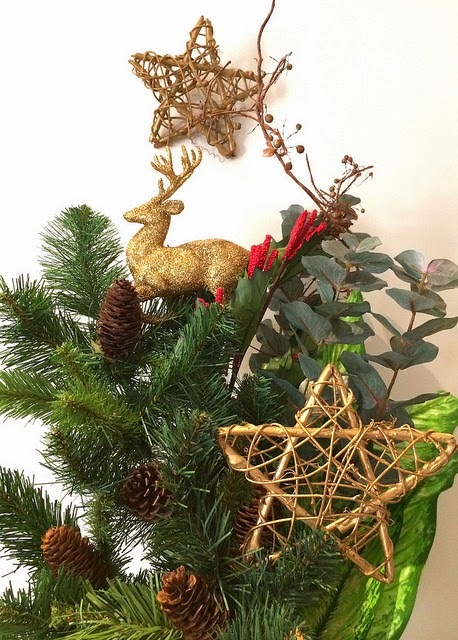 pretty Christmas vase and festive arrangement. I love love that buck! 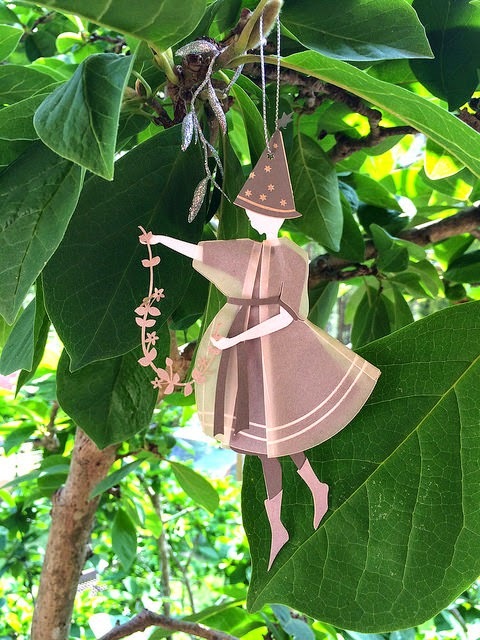 The little garden fairy on the tree branch is adorable too. Well Rachael, congrats!!! I'm the follower who asked permission to use your clamshell quilt as my PC wallpaper. I see it every single day and "smile" every time too. Thanks for the secret giveaway. i am "smile"ing because I love your clam quilt! congratulations on the magazine feature...well deserved for sure! Pictures of australian quilts make me smile. y'all have a great use of color. Congrats, on having your clam shell quilt published! Merry Christmas to you too! Congratulations on the article! Your quilt looks so good filling the magazine page. Well-deserved. I love your unique holiday floral arrangement as well. Looking forward to seeing your new (and old) creations in 2015! Congratulations Rachael, when I opened my issue and flicked through, I got excited, I thought hey I know this lady. It is a beautiful quilt. Congratulations on the magazine article.... your Happy as a Clam quilt is wonderful!!! I'm so happy for you! Congratulazioni per il tuo grande successo! Yay for your joyful and smile-ful quilt! This is the first time I'm seeing it, and wow, it's amazing! Merry Christmas , Rachael! So pleased that you appear in an article in the magazine. A great magazine which I love reading when I'm in the Southern Hemisphere. So, I would love to enter your giveaway and put a Smile on my face as I think of you enjoying Summer whilst we are in the middle of dark nights. Merry Christmas to you too. How exciting about being published. So you should be jumping up and down with joy. Soak up the moment. It's lovely to have smile prompts around! As lovely as the smiles of those you love. It just makes a whole day instantly better if you can make someone else smile as well. I love your Happy as a Clam quilt. I daresay it might be my favorite, but I'd hate to box it in ! :) Happy New Year! Oooh, Congratulations Rachael -- I'm sorry I'm so late getting around to seeing this, but it's still VERY exciting!!! I was thrilled when I was flicking through my sister's copy of the magazine and saw your quilt on the pages. Congratulations. I wonder what quilts you will wow us with this year? Thank you so much for leaving me a comment. I love to hear your thoughts. I don't always have time to reply but your wonderful words encourage me to keep sharing my work and stories.